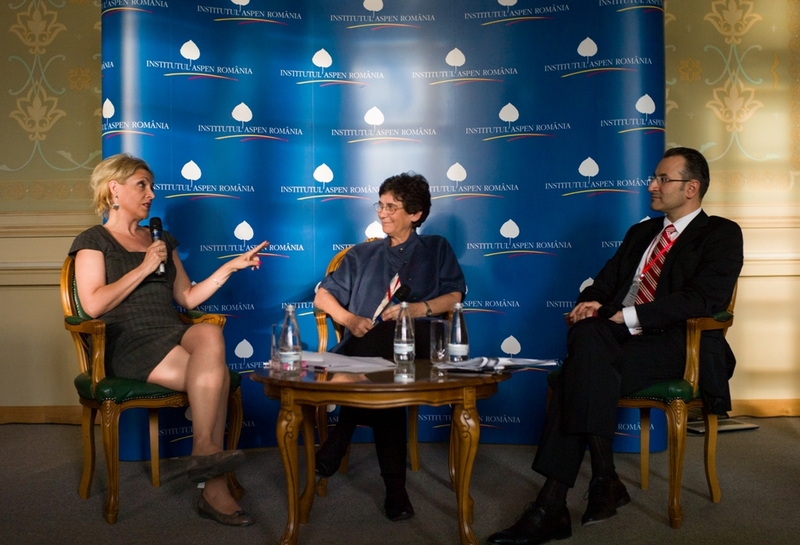 The fourth Conversation in the 2013 Festival of Ideas took place on September 27, after the second day of Bucharest Forum 2013. The Conversation focused on three very important elements of a modern society: education, identity and gender. The guest speaker, Ms. Kathryn Kolbert, Director of the Athena Center for Leadership Studies, Barnard College, US also shared with the audience her experience with the Athena Film Festival as the first edition of the Festival of Ideas has also focused on the arts and the role of artistic events and cultural management. Participants to the debate also include Ms. Liliana Popescu, Pro-rector of the National School for National School of Political Science and Public Administration. Kathryn Kolbert is the Constance Hess Williams ’66 Director of the Athena Center for Leadership Studies and Professor of Leadership Studies at Barnard College, an interdisciplinary center dedicated to the advancement of women’s leadership. Since 2009, the Center has created innovative approaches to leadership development for students and adult women in New York and across the globe. Prior to coming to Barnard, Professor Kolbert spent a year in Washington D.C. as the President and CEO of People for the American Way and People for the American Way Foundation, two of the nation’s premier civil rights organizations. Before she became a journalist, Kolbert enjoyed a long and distinguished career as a public interest attorney specializing in women’s rights. From 1992 to 1997, she directed domestic litigation and public policy programs for the Center for Reproductive Law and Policy, where she was a co-founder and vice president. She has also served as the State Coordinating Counsel of the ACLU’s Reproductive Freedom Project in New York and as a Staff Attorney with both the Women’s Law Project and Community Legal Services in Philadelphia. The Festival of Ideas is a public event of the Aspen Institute Romania, inviting participants to engage in deep and meaningful discussions on the overlaps between social and personal identity, success in the arts and culture, education and how these can serve as identity pillars. In partnership with the George Enescu Festival and with the support of the Aspen Institute’s Ideas Festival, this event is based on the experience of the Ideas Festival, which happens every year in Aspen, Colorado and gathers an impressive number of outstanding leaders from around the world in a one week challenge of ideas.